Custom home renovations are important for ensuring a beautiful space and increasing the value of your Mooresville, NC home. Custom Home Renovations in Mooresville & Lake Norman – When moving through your home, do you often find areas you wish you could change? Do you visit the homes of friends and family and leave visualizing your own renovations to match theirs? With our team at Chad Goodin Signature Homes, there is no better time than now to have the home you’ve been dreaming of. Our custom home renovations can give you a home you no longer need to compare to others. Let your home be the one your family and friends admire! 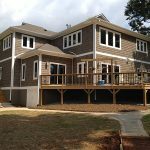 Custom home renovations may simply involve updating the current design, or they may include reworking the entire space. Home renovations are important for not only ensuring a continually beautiful space, but they can also increase the value of your home. No matter your budget or design plans, let us help you create a plan to fit the needs or your family and your space. We take into account your style, desires, and budget to design an updated space in any area of your home. We have been working with Mooresville, NC, area homeowners for over 30 years. Our extensive experience and reputation ensure you receive every important detail. We can offer ideas and solutions throughout the process to give you a luxurious new space. There is no end to the many options available with our custom home renovations. We offer you a dependable, honest, and affordable home renovation service. If you are considering a home renovation or you are unhappy with a current space in your home, contact us today. Let us get you started on a plan to create the home you’ve always dreamed of. At Chad Goodin Signature Homes, we proudly perform custom home renovations in Mooresville, Cornelius, Davidson, Huntersville and the surrounding Lake Norman area of North Carolina.